I had the privilege of listening to “Love God. 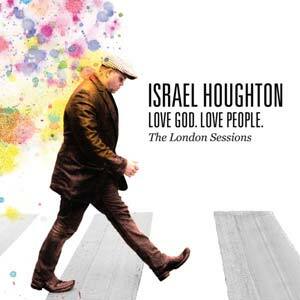 Love People.”, the new release by Israel Houghton set to release on August 31st, to review for All About Worship. I have been anxiously awaiting his next release, following “The Power of One”, which was hugely successful, garnering a Grammy for the Best Pop/Contemporary Gospel album earlier this year. This new album was such a joy to listen to! It did not disappoint in any way! As the title indicates, this new project “is a return to a simple, foundational Gospel command: Love the Lord with all your heart and your neighbor as yourself,” says Israel. The album was recorded at the legendary Abbey Road Studios in London, and features Israel and the New Breed along with a group of outstanding guest artists, including Kirk Franklin’s vocals on “Mercies”, Fred Hammond on the bass guitar and smooth vocals in “Surprises”, and half of the Take 6 group on the beautiful “Hosanna (Be Lifted Higher)”, one of my favorite tracks on the whole album! It’s hard to describe the style of this new album, with much of it having the all-familiar Israel Houghton gospel style, which is so wonderful! But, there is also a mix of rock, funk, pop, reggae, and a few more surprises thrown in, including The London Session Orchestra, and Israel’s version of the the recent Passion song “Our God”. From the first few seconds of opening title track, I knew this album would be a lot of fun to listen to! I put on my headphones, turned up the volume, sat back and enjoyed a captivating musical journey filled with exciting moments of upbeat gospel praise, excellent tight vocal harmonies, outstanding musicians, and plenty of surprises along the way. I had to take off my “worship-leader-looking-for-new-songs” hat that I usually wear when listening to new albums, because although there are a couple songs I can see introducing to our church (“You Hold My World” and “Hosanna (Be Lifted Higher)”), I thoroughly enjoyed just listening to this album, appreciating all of the outstanding, excellent musicians using their amazing talents to praise God! Some of the stand-out tracks for me I’ve already mentioned, including “You Hold My World”, a great song that could easily be adapted for churches; “You Won’t Let Go”, which fuses Reggae, Rock and that huge horn section into a contagious mix of sounds that I just had to play over and over again; and “Hosanna (Be Lifted Higher)”, mixing the beautiful string sounds of the London Session Orchestra, a pure sound of a boys choir, the tight vocal harmonies of Take 6, and Israel and the New Breed’s vocals into a powerful worship song that builds and builds to an amazing climax of worship. The perfect way to close out this powerful project! You will definitely want to pick this CD up when it comes out the end of August. You will not want to miss it!! (Note: You can also read this review on the All About Worship website. I can’t wait for this record. I am really excited about Hosanna (Be Lifted High). I hear the writer of this song ( Sydney Mohede) play it at the Deeper Level Conference last year. Israel kind of mentioned off the cuff that he was going to put that on his next record, but I didn’t know if he was serious or not. Glad he was! I have used that song a few times at Metro since then and it has gone over very well! Can’t wait to hear what Israel had done with it!! Thanks! I’ve never been to one of his Deeper conferences, but I bet that would be great! If you have the music for “Hosanna (Be Lifted High)”, I’d love to take a look at it!